Movie premiere at the Carthay Circle Theater. Image via Los Angeles Public Library (1939). 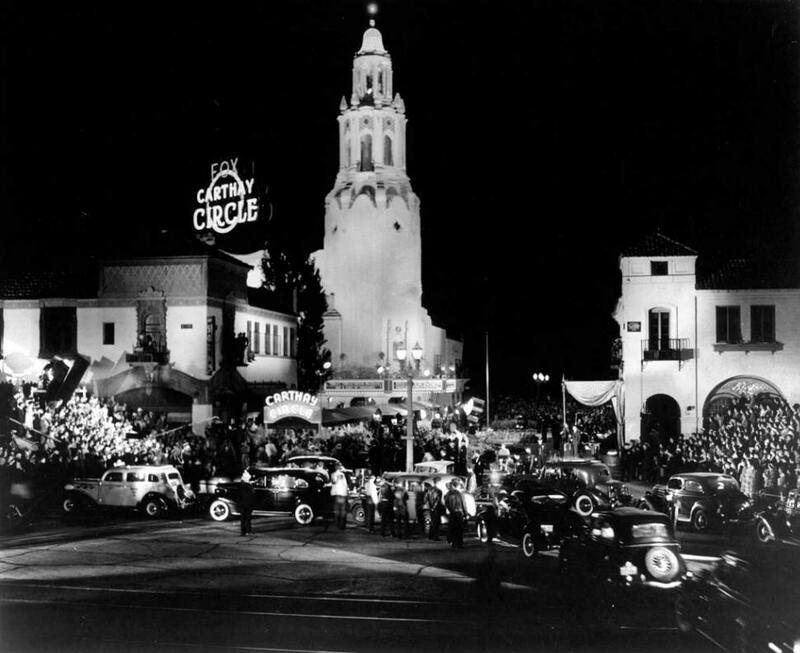 The Carthay Circle Theatre is one of LA’s historic movie palaces lost to time. The theatre opened on May 18, 1926 with a screening of Cecil B. De Mille’s The Volga Boatman, and quickly gained popularity among moviegoers, earning the nickname of “The Showplace of the Golden West.” The building was designed by architect Archibald Dwight Gibbs in a Spanish revival style as homage to the founders and pioneers of California, and featured paintings of early-California scenes by American West painter Frank Tenney Johnson, including large murals and a huge painted fire safety curtain. The theater hosted the West Coast premiere of Gone With the Wind in 1939 as well as premieres of Walt Disney classics Snow White and the Seven Dwarfs, Fantasia, and Dumbo. Unfortunately the theater was demolished in 1969 and replaced with a nondescript office building, but its spirit lives on at Disney California Adventure, where a replica of the theater operates as a restaurant and cocktail bar.